Alli Sharma: What brought you together to write the book? Andrew Ballentyne: My background is in architectural history and we set up this project wanting to look at what we now call Tudoresque architecture, noticing that it is the most built style of architecture of the 20th century, but architects despise it and they won’t acknowledge it as 20th century architecture. They think it’s a fake version of something older. But actually, from an archeologist’s viewpoint, if we take all the people away and are left with the remains of buildings to tell us what kind of society we are, most of the evidence in Britain is mock Tudor housing and that is the kind of society we live in, yet no-one says anything about it. AB: Absolutely. A lot of it isn’t artistically good and the few attempts to look at Tudoresque architecture have been from the point of view of trying to say, despite what people say, it is artistic. I wanted to say that I don’t care whether it’s good or not, it matters because it’s there, and for that reason I brought on board a sociologist who doesn’t have those hang-ups. Andrew Law: When I came to the project I had done a lot of research in advance. I have a long interest in the sociology of aspiration. So I got into this project with that in mind and then it was a perfect story in terms of the architecture. I came into it for the nostalgia and where nostalgia takes place in socio-economic relations. How nostalgia comes and what forces are present that allow it, usually a crisis or people suddenly becoming very poor. AS: And hark back to better times? AL: Yes, the powers that be encourage nostalgia when they’re in trouble, if you like. AS: Nostalgia seems to be a dirty word? AL: There are different sides to nostalgia. Some people are now saying that nostalgia has a positive, progressive role, rather than just a politically conservative role. Speaking sociologically, it’s often been used to produce nice, safe identities. AS: Can Tudor revivals, reveal more about their own historical period, rather than the Tudor period? AB: The whole thing is a construction that begins in the 18th century. The Tudors didn’t think of themselves as Tudors. They didn’t use that name. Nothing in the 16th century was labeled Tudor, not even the king. It was entirely an 18th century construction that then gets treated more and more as something that really happened as a historical period. But the Tudor monarchs were actually trying to establish themselves as continuous with previous monarchs. If you look at what’s happening now, there is a change from the House of Sax-Coburg that was christened Windsor and is now the House of Battenburg, Prince Philip’s family name. There is a change in royal houses, but you wouldn’t notice it because they stress the continuities. And it’s like that with the Tudors. The beginning is the accession of Henry VII and the thing we learn about as school children is that you have the wars of the roses and wicked Richard III coming to an end at the Battle of Bosworth. Then Henry VII takes over and founds the house of Tudor, which is the basis of the nation’s identity and prosperity and with Henry VIII we get the protestant identity. And that’s the beginning of modern English history. That’s seen as the foundation of event, the Battle of Bosworth, but that’s an 18th century construction. AS: Why did that happen? AB: Because 18th century historians were looking for a break point. Framed as a history of the kings, they tried to make sense of the past and could see that there was something different about the medieval period from the modern period and they saw the modern period beginning with Henry VII. If you look at it in a broader European sense you’d call it the renaissance. But in British history the key date is 1485. Basically, they’re looking for the origins of the modern world and finding it there. And so doing Tudor style buildings is a way of doing old-fashioned English buildings that address modern needs. They think that if you’re trying to revive an architecture that is older than that, you’re getting gloomy, cold, drafty buildings that don’t really work, but the Tudor period had comfortable homes that work in the modern world. They’re old fashioned, but old fashioned was a sign of good character. If you’re following a fashion you’re empty headed. If you’re deliberately old fashioned that shows you’re a serious person, and that’s what people wanted with their houses. AL: That reminds me, of Jane Austen’s Mansfield Park. There is some strong language about one of the characters who was a follower of London fashion. AB: In 18th century literature, you get people of quality who tend to be old fashioned and people who are very rich and tend to have more money than sense. AL: I’d also comment, from a sociological angle that also, near the end of the 18th century, the desire for Tudoresque becomes key to national identity politics, especially during the French revolution. I looked at a lot of books on antiquarianism and found there was a strong need to find something truly English because the gothic style had it’s roots in France. AB: But they didn’t think it did. They thought gothic was an English style, but they were wrong, so gothic tends to be seen as fairly British, the French were associated with classicism. AS: At that stage it was more of an artificial idea of the look rather than a timbered structural support? AB: You do get genuine 16th century buildings with timber frames but from the moment it began in the 18th century, cottage style was all stuck on the outside and every bit as artificial as a modern mass housing estate. The key place is Blaise Hamlet, built by John Nash. That’s the most highly developed, artistically, just at the beginning of 19th century but part of that wave of things. After the revolution in France 1789, the English landowners were convinced that there would be a revolution here, and there should have been. It was defused by persuading people that they had a stake in the land. They didn’t have a vote or anything. They had absolutely squalid hovels to live in so the landowners were put under pressure by parliament to improve the housing stock in rural areas and part of what they were doing, by building those little houses, was to remind the peasants that they were English and not French and so they were enjoying the connection with the British land in the way French peasants didn’t. AS: Have there been many revivals at different points in time? AB: It’s fairly continuous. It’s been done in different ways, with different amounts of money to spend, but it’s there all the way through. AL: To some degree, we identified two styles, black and white or ‘magpie’ style or Hampton Court, manor house style. Elizabethan masonary buildings were copied by rich people with the key things being steep gables, tall chimneys, square windows, not pointed ones, sometimes a pointed arch, but basically there is another sub-group which is educational buildings because of the principle of Oxbridge college but that’s steep on one size. That’s a special sub-group of Tudor revival. Then the other group tries to look like cottage buildings, which are the black and white buildings. Those start off being buildings built by landowners for their tenants but then they go quite a way up the social scale with some palatial cottage buildings. Ascott House is an example of a huge sprawling black and white farm house extended by the Rothschild family from 1890s or earlier. AB: I think its been there pretty continuously. Architects have not liked it since the 1930s. It’s the influence of Modernism. Some architects get the idea that it’s correct to be modern and wrong to be old fashioned. Then Tudor style things become wrong in the eyes of the architectural establishment but that’s not true of the general population. Whenever anyone without any architectural education is in charge of a big project, then it stands a fair chance of being Tudor, whenever it was built, any time after 1920-30s. AS: So it was the beginning of Modernism that changed things? AL: Another big Tudor explosion happened after the First World War. Again, several factors are at play, the Russian Revolution abolished serfdom and, again, we can compare to French Revolution. Also, lots of people died in the First World War and there was a sense of homes for heros and an aspirational splurge where Tudor homes become something popular. Its almost a right for people who have been trampled. I looked at Ideal Home magazine and analysed early copies. On the front of the 1919 first edition, there are Tudor style houses. They don’t have to explain it or refer to it because it was just the normal style. AS: It’s overlooked because it’s everywhere. AB: If you look at DIY magazines, it’s very often a Tudor style thing they’re showing you how to do. It goes without comment. AL: It’s aspirational, do-it-youself, adding beams. Whereas, if it was in an architectural magazine, or in a place dominated by official architecture it would need a lot of explaining. 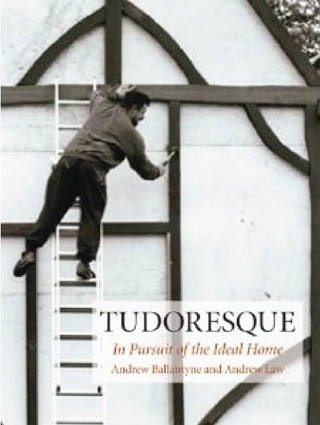 AS: Could mock Tudor be understood as Baudrillard’s simulacra? AB: I have a problem with that because if you take a doctrine as Modernism stands, you would say all historical styles are wrong and you would have to do something that expresses the true nature of the time and circumstances that you’re in, otherwise it’s fake, it’s a simulacra of something that goes on in the past. The way to be straightforwardly modern is actually to copy approved models of modern building, those are simulacra as much as anything else, but we don’t treat them like that. Similarly if you’re reproducing historical styles in architecture, it’s still a real building at the end of it. It works and it’s a mute point to say whether it’s fake to do that any more now than when it was originally done. It’s still doing the same thing, in the same order, with the same result. So I think the whole idea of architectural fakes is not rigorously understood and people are prepared to make exceptions for things they like. AS: It’s about taste then? AB: I think it’s down to taste. AL: I think there’s something dangerous in this search for authenticity. It’s taste that is given a moral dimension so there is a language of cultural superiority but also a language of dismissing things as being immoral, improper, kitsch or bad. It’s a bit different from becoming just taste; it becomes something bad. There’s a long literature about the social making of taste and the production of taste. A model that people follow is Bourdieu. His ideas are useful in the way he looks at cultural patterns and produces text for reasons and his major argument is exclusion, to denote boundaries. AS: Tudor style became very popular, is that why it’s reviled? AL: I think so. I think it’s a snobbery against massness. You can find it on the left and right. In the Frankfurt School there is huge anti-massness. Massness is seen as dangerous. And then on the right, there’s plenty of evidence too. AB: If you look at architectural history, the big style things are classicism, which has an aristocratic elite background and Modernism, which has an intellectual elite background. Tudor is actually a populist thing that carried on despite being condemned. There’s something genuine about it. AS: And linked to identity. AL: Another thing that connects with that are industrial mansions where you get people building cottage-style Tudor estates for their workers and then a manor house for themselves where the manor house can look like a masonary building or it can look like a big cottage. It can go either way, but nevertheless its part of the same ensemble, part of the same, like Bournville in Birmingham or the Mander family at Wightwick Manor in Wolverhampton. There’s a sense of a move by the bourgeoisee to position themselves as morally superior to the aristocracy by looking more down to earth and showing they could live in a big Tudoresque place. AB: But there’s also a sense of it being unpretentious, down to earth, not laying claim to having aristocratic airs and graces, being one of the people, but a rather richer kind of person. AL: I was in a garden suburb taking photos and someone came out and asked me what I was doing and when I explained, they got really irritated and said, ‘you’re suggesting that this is Tudoresque - I’m living in an Arts and Crafts house.’ I said there are snippets of the aesthetic up there and they replied, ‘really, how awful’. It brought out this disgust. Like Margot Beste-Chetwynde in Evelyn Waugh’s novel, Decline and Fall. AB: She’s the idiot fashion victim. She tears down the finest Tudor house in England and puts up a modern cube by a German architect. That’s another thing. Modernism is always portrayed as German. Arts and Crafts architecture is good in the eyes of architects because it’s soundly built and expresses the means of construction, and was written up by Hermann Muthesius in Das Englische Haus as the style in which modern architecture took root. So you get this pedigree from Arts and Crafts, into German Modernism and then it gets reimported. But you also get the suburbs which are a much more direct translation of Arts and Crafts things. That’s described as popularization or bastardisation of Arts and Crafts and it’s entirely repudiated, but that’s the direct influence. There it is, as people build cheaper houses on lower budgets, but it’s aspiring. AL: There’s another theme key to the development of why Tudoresque is seen to be terrible. Beverly Spencer at Manchester University is doing research on class in the present day and interviewing middle class people about taste. The one thing she comes up against again and again is this idea of being cosmopolitan as being tasteful and if you’re too local or too national that’s really bad taste. That is repeated throughout times, in different and complex ways. Her research is interesting. Cosmopolitan is an ability to leave your country or choose an architecture, which isn’t local and has cache, whereas Tudoresque is seen as something too parochial. AB: That’s right. In Britain the cosmopolitan aristocrats of 18th century went on the grand tour and started building Palladian buildings here. We’ve got an example of a mock Tudor house in Malaysia built by a doctor who studied in the UK. Culturally, he’s doing exactly what the aristocracy was doing in the 18th century but in Malaysia. It’s the adoption of something nostalgic for his period of formation in this foreign country that sets him apart as an elite cosmopolitan figure. Then his son, who grew up in this house, came to study architecture in the UK and learned how embarrassed he ought to be by his father’s house and wrote a dissertation about it. The other thing you find is that British Pavilions, like in the Disney Epcot Centre in Florida, or world fairs up until 1930s, were always Tudor but, having thoroughly identified with that style, it doesn’t look modern any more and now, when you look at British Pavilions, they’re ultra modern, like the spiky one at the Shanghai Expo. We want to look as avant garde as possible to correct this old fashioned image that the rest of the world wants to give us and the reason they want to give it to us is because for the last couple of centuries that’s the image we were projecting.